It is a good thing for us that historical researcher Natalie Grueninger and historian/historical fiction author Sarah Morris did not live in Tudor times where correspondence and travel took weeks on horseback. Despite living in different countries, they forged a friendship online, and the result has brought us In the Footsteps of Anne Boleyn. The book will take you on a trip through stately homes, chapels, castles and artefacts associated with Queen Anne Boleyn, whose tragically short life has captivated the public for almost five centuries. We spoke to Sarah and Natalie this week on the conception of the book, the historical sites they visited and taking a walk in Anne Boleyn’s shoes. 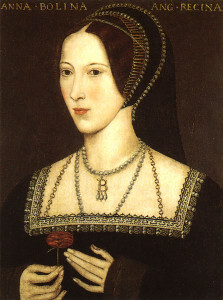 Natalie what inspired you to create a blog dedicated to the life of Anne Boleyn? In 2009, my sister and I decided to travel to England to visit some of the sites associated with Anne Boleyn. 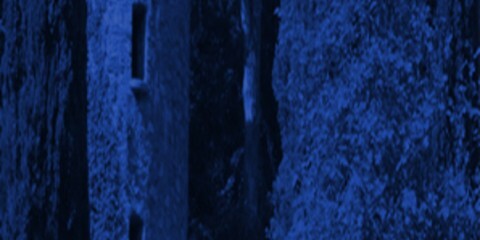 We wanted to walk in her footsteps and see the houses, palaces and castles where her extraordinary life had unfolded. We searched the internet, desperately seeking information on locations that Anne had visited, but only found a small handful mentioned over and over – Hampton Court Palace, Westminster Abbey, The Tower of London, Hever Castle, Windsor Castle – and we just knew that there had to be more. It was at that time that On the Tudor Trail was born. 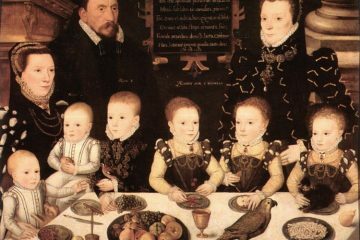 Not only did I want to provide readers with a more comprehensive list of ‘Anne places’, I also wanted to share information about her life, the Tudor monarchs and sixteenth century England. The site quickly evolved into a space for me to share my own research, as well as interviews with authors, historians and various experts. The aim was, as it still is today, to bring people together who have a passion for Tudor England and to provide a space where we can learn from each other through interactions and discussions. Sarah what was your inspiration behind Le Temps Viendra? Have you ever dreamed about what it would be like to wake up in the shoes of your historical hero or heroine? I have. 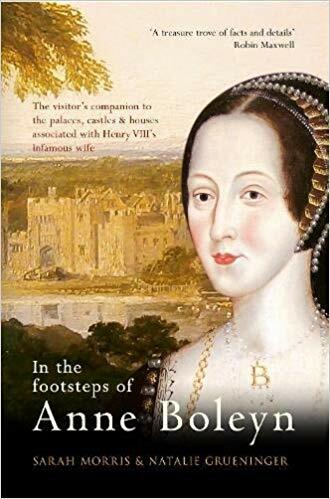 For me, personally, this has always been Anne; I have always held a secret longing just to be in her body and hear her voice, see her face and taste the glittering and dangerous world of the Tudor court first-hand. 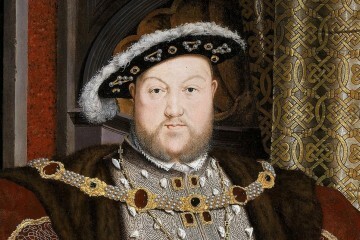 What would it be like to be held in the arms of the great Henry VIII, to be adored as he adored her – intoxicating indeed, I imagine. However, of course, whilst it would be one thing tasting the sweet fruit of their early romance, I am not so keen on the idea of staying around too long after she married him, when I believe that their relationship began its decline. But this is an interesting point actually. In writing the book, I tried to subsume myself, as deeply as I was able, in Anne’s body. I would use all my sensory modalities of sight, hearing and especially touch and feeling to gain a foothold in her world. Perhaps more keenly than anyone might imagine, I came as close as one is able to walking in the shoes of a long dead, sixteenth century queen. During the halcyon days of their romance, it was breath-taking to feel her world through her; the intensity of the relationship between Henry and Anne. However, in time, I also had to follow her into deep despair, loss and terror. It was a painful process as I walked with her to the scaffold. A little bit like the heroine in the story, there were moments when it was a little difficult to know where Anne stopped and I began. By the time I finished writing the final scenes in September 2012, I was completely exhausted emotionally. I don’t think I could have gone on much longer. Writing LTV, and telling the story of Anne’s innocence and how it was that such love turned to betrayal, was truly a labour of love. 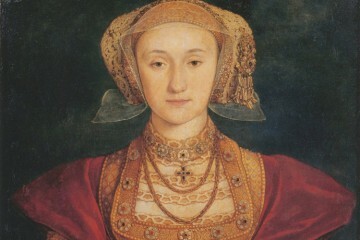 How did you become interested in Anne Boleyn? Sarah: I came to Anne through her daughter Elizabeth. Here in the UK, at school, the Tudors are part of the curriculum. I was first introduced to Henry, his six wives and children when I was about eleven years old. I fell in love with them immediately; the triumph and tragedy, the palaces, clothes, architecture – everything. Although I have to say, my mind was probably fertile ground, as my parents took me to visit historic houses from before I was able to walk; I grew up with a love of English history flowing through my veins. Anne of course, has a special place in my heart. She was a courageous, spirited young woman of intelligence, grace and wit. As I say in LTV, like Henry, I was quickly captivated by her glamorous, free-spirit, and later moved and inspired by her courage and determination to be her own woman, in spite of the many dangers that faced her. 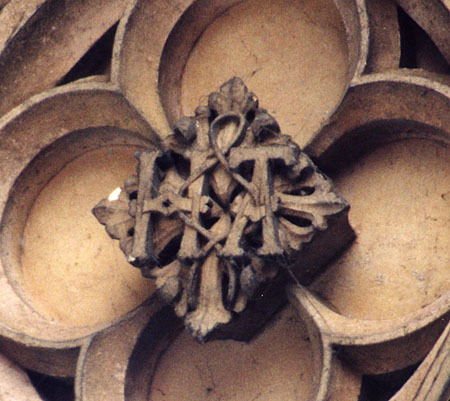 How did you two meet and decide to collaborate on In the Footsteps of Anne Boleyn? 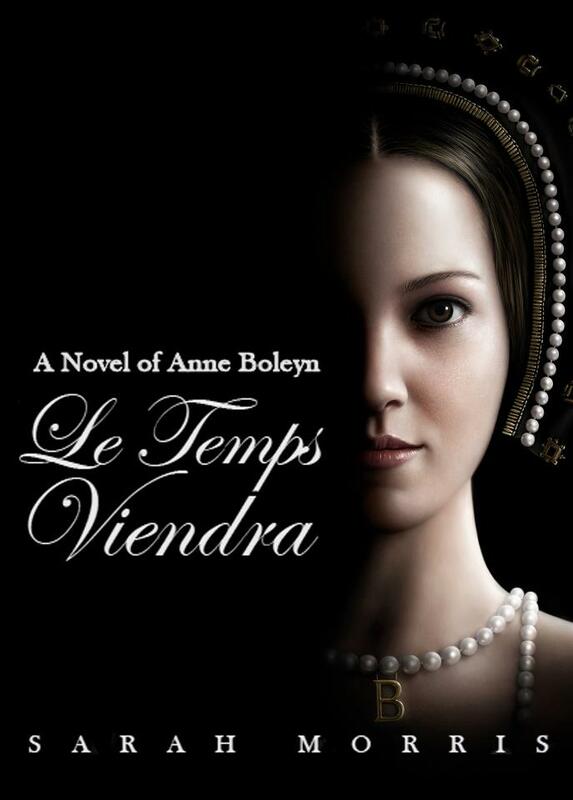 Natalie: A few years ago, I came across Sarah’s Twitter account and was immediately intrigued by the novel that she was writing, which incorporated two things that I love – Anne Boleyn and time travel. So I got in touch and from there our friendship developed. We only met in person for the first time in 2012 and I’m happy to say that we hit it off! Among other things, we are united by our fascination with Anne Boleyn and our love of historic buildings. Sarah: It was a fortuitous meeting indeed! Natalie is a very generous person and was the first to welcome me onto FB by promoting my new page dedicated to the novel, way back in February 2011. We never looked back! 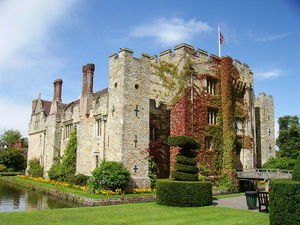 Since I had so much material about the places associated with Anne Boleyn from writing Le Temps Viendra, and Natalie similarly had a wealth of knowledge from her research for On the Tudor Trail, we decided that we had something of value to share with the world, and set out to pool our resources together and go on our own epic adventure. Tell us about some of the historical sites you visited while researching the book. Natalie: Between us, we have visited almost all of the sites featured in our guidebook and there are over 70 of them, so where do I begin? 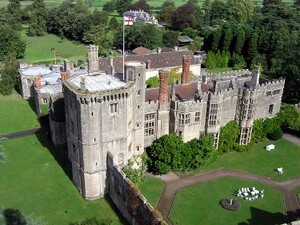 Perhaps I’ll share a few of my favourites: Thornbury Castle in Gloucestershire is the only Tudor castle to be opened as a luxury hotel. I stayed overnight in 2009, what an experience! Anne and Henry stayed at the mighty fortress for around a week during the summer progress of 1535 and today, it’s possible to sleep, as I did, in the very room where Henry VIII slept during his stay – the Duke’s Bedchamber – completely mind boggling! Sudeley Castle, also visited by the royal couple in 1535, has a special place in my heart. Nestled deep in the Cotswold Hills, Sudeley Castle exudes a sense of timelessness and Anne is not the only Tudor queen to have walked its grounds; Henry VIII’s sixth wife, Katherine Parr, spent her final days at Sudeley and Lady Jane Grey is among those who have called it home. Acton Court is a rare beauty—a moment frozen in time— and stands as a stalwart reminder of the great lengths that one courtier went to, to impress his sovereigns. The Vyne in Hampshire, once a great Tudor powerhouse; the home of William, Lord Sandys, Lord Chamberlain of the Royal Household, today houses one of the most beautiful long galleries that I have ever seen. 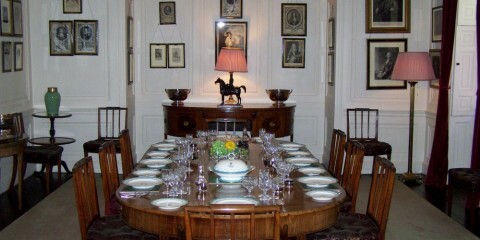 The showpiece is the exquisite floor-to-ceiling linenfold panelling. Another showstopper is the magnificent chapel, one of the most lavish private chapels of its time. Over the course of researching In the Footsteps of Anne Boleyn, I also visited, among other places, Hampton Court Palace, Winchester Cathedral, the Tower of London and Hever Castle – all favourites of mine. This is of course just a taste; you’ll have to read the book to find out more! Was there any particular place that really resonated with you? Sarah: This is always a difficult question because there are numerous – and for different reasons. However, broadly speaking, you might be surprised to hear that I found myself most drawn to locations that had been almost entirely lost. Perhaps the ragged ruins of lost palaces, or glimpses of grand manors, now swallowed up into the ground, resonated with the feeling that like Anne, they left behind an enigmatic sense of what once graced England’s landscape. On a more practical level, these locations have also been mostly, or completely, overlooked in Anne’s story. So it was exciting to uncover their place in the story of her life, and sometimes to reconnect a property or location with England’s most iconic queen consort. One particular example of this, for me, is the Old Palace of Langley in Oxfordshire. I actually live about 10 minutes drive from the location, but had no idea of its existence or significance; which in itself I found beguiling. It is all but lost from the local history of the area, but the palace (or manor) was once a much loved hunting lodge, developed by Henry VII after purchasing it from the mighty, Neville family. I remember first driving up to the site, an isolated ridge looking out over the beautiful Oxfordshire countryside. I wandered alone down the lane on a bright, but cold morning, only sheep in nearby fields to watch me with suspicious curiosity. There I came across a field with very clear earthworks, lying adjacent to a farmhouse, which even at a distance, and set back from the road, gave a sense of once belonging to a much grander building. It was such a peaceful and romantic spot. I already knew enough about the place to know that Henry VIII visited it on a number of occasions during his summer progress with Anne. It was used as a satellite hunting lodge; the king would take a reduced household with him for extra privacy, while the wider court was left behind at nearby Woodstock. As our research deepened, I would return with Natalie, and we were lucky enough to meet the local farmer who showed us around. 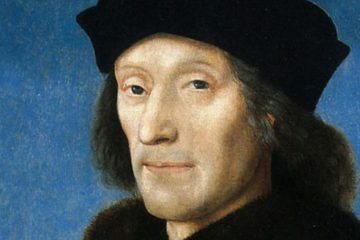 He took us up to the house, where we could see the initials of Henry VII and Elizabeth of York carved into the stone above a window; the field where I had first seen the earthworks, turning out to be the site of the manor’s privy gardens. It was so easy to imagine the garden in one’s mind’s eye, and see Anne and her ladies walking there in the sunshine. Away from the site, after an exhaustive search, and when I had nearly given up hope of finding anything, I uncovered an old paper written on the manor, which felt like uncovering lost treasure. To seal the place in my heart, one of the few letters that we have written by Anne is signed, ‘from my lord’s manor of Langley.’ Sadly, no contemporary image or complete description of the palace survives, although we have snippets of information, which gives clues as to how the house might have looked in its glory days. However, like the lady herself, Langley’s full story remains hidden just out of reach. What do you hope to bring readers that is new in this exploration of Anne’s life? Natalie: We hope that you’ll be introduced to some fascinating new locations, places that you were unaware held any connection to Anne. And when it comes to places that already draw large crowds, like Hampton Court Palace, our hope is that you’ll visit them with Anne’s story in the forefront of your mind – and see them through her eyes. Sarah: I think In the Footsteps of Anne Boleyn is the first book of its kind, bringing together over seventy locations associated with Anne Boleyn in one place. By following in her physical footsteps from the cradle to the grave, it has been interesting for us to see Anne’s life from a different perspective, through the bricks and mortar that formed the backdrop to one of England’s greatest love affairs. It is an unusual perspective. But more than that, certain locations, particularly in France, begin to instruct us about how and why Anne became the woman she did. Certainly, if you make the pilgrimage to Paris and the Loire in particular, and begin to taste for yourself her life there, through the places she lived in, it becomes clear how her preferences in art, music, literature and architecture were formed. Also, when you realize that she was in contact with luminaries of the time like Leonardo da Vinci and reformist writers like Clemont Marot, as well as being groomed by emulating indomitable women like Margaret of Austria and Louise of Savoy, you see how she became the courageous, determined and forward-thinking woman who would later shape the future of England. 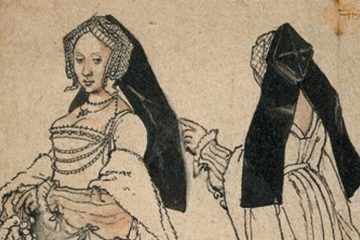 All of Henry VIII’s wives were interesting in their own right. What do you think it is about Anne Boleyn that has continued to capture people’s imaginations for almost five centuries? Natalie: I think there are many reasons why Anne Boleyn continues to captivate us 477 years after her death; her fierce intelligence, complexity and bold personality immediately spring to mind. She was an accomplished singer, dancer and musician, educated in two of the most sophisticated courts in Europe; she spoke several languages and was skilled in the game of courtly love. Anne was courageous, witty, determined and an astute politician. She was a sixteenth century woman with a voice! Anne Boleyn was magnetic; she could inspire fierce loyalty and, I believe, was the only one of Henry’s wives who, for a time, managed to control him. Anne was also very loyal and generous, often helping members of her family, her friends or those sympathetic to her cause. On the flip side, she could be ruthless, calculating and unrelenting. She had a fiery temper and gave into bouts of ‘rashness’. As well as inspiring fierce loyalty, she inspired hatred. This dichotomy coupled with her extraordinary story —her rise to fame from relative obscurity and her dramatic downfall—make her compelling and addictive, perfect fodder for the novelist! The fact that so much about Anne is unknown, debated and controversial also captures the imagination. Her dark eyes beckon us to try to understand her, to know her and once she captures you, there is no escaping. We just need to look at her downfall to see the power she wielded. It was not enough to simply divorce her or banish her. She was so powerful that she had to be destroyed and her faction annihilated. She met her end with courage and honour and I greatly admire her strength. Visit Natalie Grueninger at On The Tudor Trail and Natalie Grueninger. Visit Sarah Morris at Le Temps Viendra. You can read the introduction of In the Footsteps of Anne Boleyn here.